A desk is a desk, right? Well, not really. Many different types of desks have developed over the centuries, and many of them don't resemble modern home and office desks much at all. A number of these styles have been revived over and over, and still inspire reproductions in their likeness. Some also overlap in their descriptors. These include slant-fronts like the escritoire and fall-fronts like the butler's desk, among a number of others. The Bureau Mazarin is an early type of kneehole desk dating from the 1660s, with two or three tiers of drawers on each side, a small central drawer and a drawer in the kneehole space as well. It usually has eight (but sometimes four) turned legs resting on toupie feet, connected with X-stretchers or H-stretchers. Often referenced as a butler's chest, this is a type of drop-front desk, fairly short and compact but substantial and square in shape. The interior contains several small drawers, cubbyholes and letter slots surrounding a central door. Some models also have two exterior compartments flanking the fall front. The lower half usually has three to four drawers or, occasionally, shelves behind two doors. 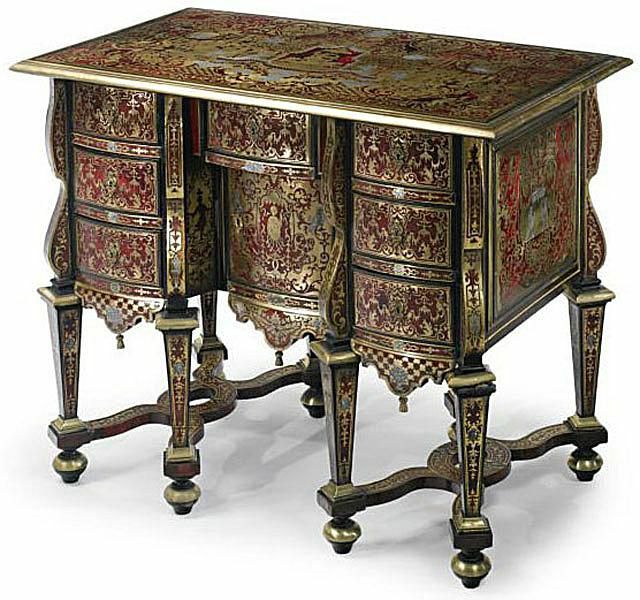 Dating from the late 18th century, and continuing in popularity for the next 100 years, this desk usually reflects predominant furniture styles of the period in details such as the feet or ornamentation. Sometimes referenced as a butler's chest since, when closed, it resembles a chest of drawers. While fairly plain - as befitting a utilitarian piece of furniture - butler's desks often had fashionable decorative details. Those made during the second half of the 19th century, for example, might have had a spindled galley typical of the popular Eastlake style. The Cheveret is a variety of small, delicate stand or desk, specifically of the type commonly referred to as a "ladies writing desk." Distinguished by the multi-drawered setback chest or bookcase on the top, the smaller piece has a handle and is usually detachable while the main surface typically has a drawer underneath and often a fold-out or pull-out shelf. The legs on a Cheveret can be straight, saber style, or tapering, and are sometimes connected with a lower shelf as well. Though probably originating in France, Cheverets further developed in England in the latter half of the 18th century, representing the vogue for light, portable furniture. They continued to be popular into the Regency period, until the 1830s. The Davenport is a type of small case desk, with a slanted and/or pull-out top and a row of drawers down one or both sides. Some have one side of working drawers and one side of faux drawers. Many also have small front drawers, cubbyholes, hidden compartments released by a knob in one of the drawers, or pop-up galleries. The Davenport dates from the 1790s, developed by a British furniture-making firm named Gillows (also known as Gillow & Co.). Its name derives from the client it was made for, a Captain Davenport. Because of this military connection, and the desk's compact size and multiple compartments, furniture historians theorize the piece was originally intended to be used on a ship, or on military campaigns. They are sometimes referenced, in fact, as a ship captain's desk. However, the Davenport became popular on dry land in the 19th century, in homes throughout England and the United States. Originally a simple chest of drawers with a swivel top, it grew increasingly ornate, with pilasters or cabriole legs in front. It traditionally rests on bun feet, often with castors to make it portable from room to room. Developed in the early 18th century, the escritoire grew out of - and the term may still apply to - a writing box or small cabinet with a drop-front and drawers or shelves dating from the Middle Ages, most likely from Spain. This popular type of desk, also known as a drop-front, originated in Spain in the 16th century as the vargueño. Since then it's been incorporated into many different desk styles, including the Butler's desk pictured. This type of flat-topped desk, first made in England in the early 1700s, features a flat top supported by two banks of drawers or cabinets separated by a space for the legs of the person using the desk. It has been manufactured in many different styles since its introduction and is still popular with companies producing Colonial reproductions. This antique desk style, popular from the late 1800s through the early 1900s, is said to have originated in England. Two-sided desks such as these were often used by bankers who wished to work together for convenience. They are the same on each side allowing individuals to face one another. Since they are essentially office furniture, they are usually heavy and well-made from quality woods such as mahogany or oak. Some examples have leather tops as well. Slant-Front desks have evolved over time, with the first examples having hinges at the top. Many different types and styles have been made with slanted tops since then, including a number of those shown with this feature. 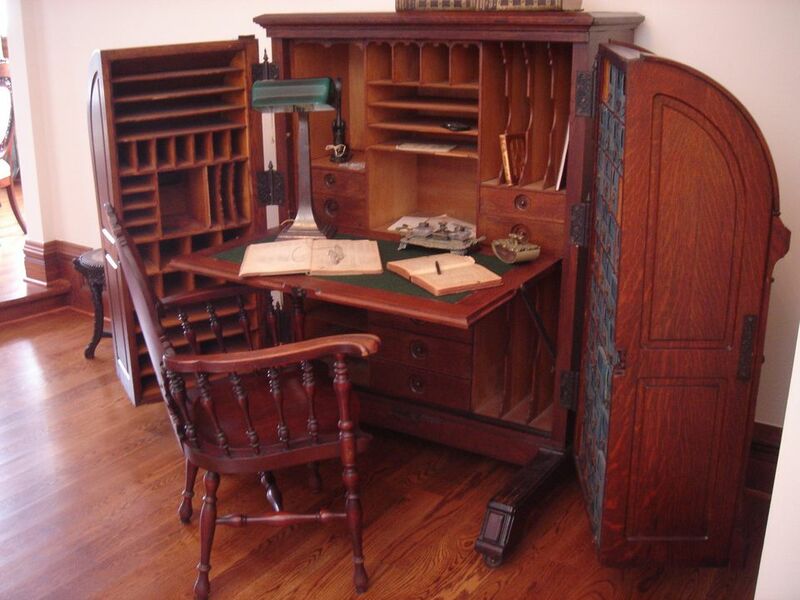 This coveted Victorian desk style was the executive's choice when it was first introduced. In fact, it was deemed "The King of Desks." Today collectors relish finding these marvelous pieces more as curiosities and conversation starters than for their usefulness. Special thanks to contributing writer Troy Segal for her assistance with this article.